This is the authoritative, hands-on book for Ford EEC-IV Engine control Systems used on Ford cars and trucks. More than 16 million cars and trucks are covered by this book. 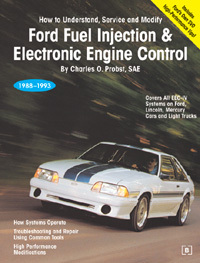 As with his acclaimed Bosch fuel injection book, author Charles Probst worked with Ford engineers, trainers and technicians to bring you inside information on the operation of Ford engine control. His comprehensive troubleshooting, service procedures and tips will help you master Ford's engine control system. For the best high-performance tuning information Probst went straight to the experts-Ford's own Special Vehicle Operations (SVO). He also includes recommendations from some of the best-known Ford tuners and aftermarket parts suppliers. No other book gives you this much detailed, proven information, with 454 pages, including model-specific wiring diagrams, trouble codes and test specifications, and hundreds of photos and illustrations. How to read 2- and 3-digit trouble codes-what is your engine telling you?